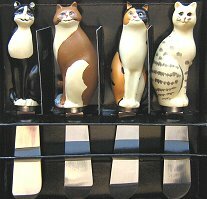 Four of Warren Kimble's unique cats grace the top of this spreader set. Each spreader is 4 1/2" high x 1" wide at the top. Ceramic handles, stainless steel blades. Hand wash. Boxed set of four.